Trump goes big with White House Christmas, but who pays? 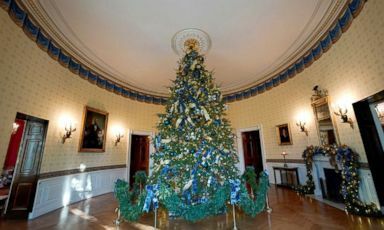 Christmas at the White House in the eyes of President Donald Trump has been a big and merry affair in his first year on the job. “I told you that we would be saying ‘Merry Christmas’ again, right?” he told a gathering at a recent speech in Missouri. The Trumps are ringing in the holidays with a flurry of Christmas-themed events that have packed the presidential mansion for the month of December. First lady Melania Trump expects to host and attend with her husband approximately 20 holiday receptions, her office said. She will throw the doors open to roughly 25,000 guests who will shuffle through the festive state floor, in addition to 100 open houses expected by the end of the year. “The first lady has seen to every detail,” her press secretary Stephanie Grisham told ABC News. Planning began in June, Grisham said. Decking the halls took a small army. 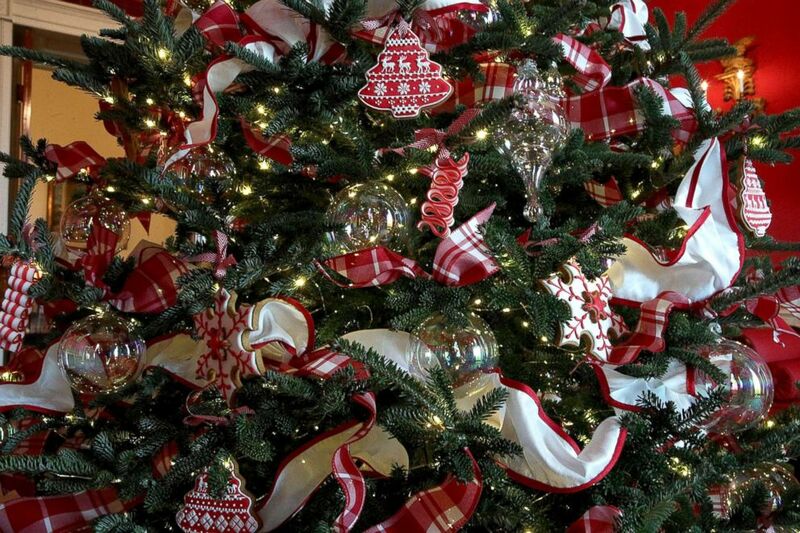 More than 150 volunteers and White House staffers wrapped 53 Christmas trees with 18,000 feet of twinkle lights and hung more than 12,000 ornaments on their branches, according to the first lady’s office. Doors and windows across White House grounds are adorned with 71 wreaths. And from the White House kitchen, pastry chefs cut and decorated 31,000 Christmas cookies and assembled a candy-studded 350-pound gingerbread version of the presidential mansion. 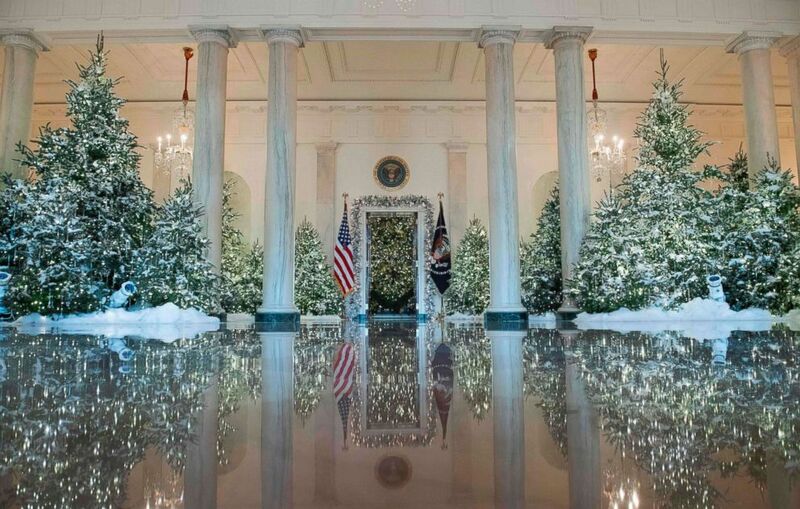 It took a combined 1,600 hours of labor to get 1600 Pennsylvania Ave. in the Christmas spirit, according to the White House. Christmas trees are seen during a preview of holiday decorations in the Grand Foyer of the White House in Washington, Nov. 27, 2017.
Who pays for the decorations? 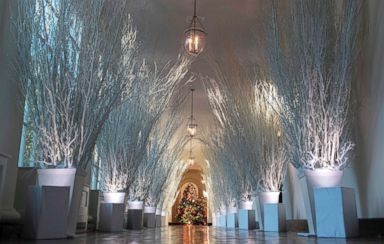 And while the style is unique, the amount of Christmas decoration in the Trump White House appears consistent with their predecessors’. A colorful illustrated brochure depicting this year’s themed decorations — and signed by Donald, Melania and Barron Trump — is distributed to each of the thousands of guests. Illustrator Jim Starr of Stewartstown, Pennsylvania, told ABC News he took on the project pro bono. “It was an honor to be asked by the White House to do it,” he said. He got 25 tickets for White House Christmas tours in return. Aides declined to say how much was spent in printing costs. 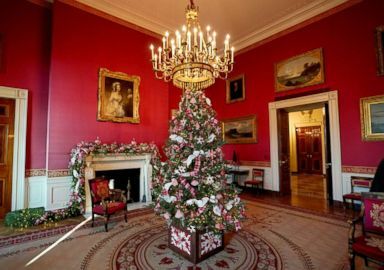 As for the yards of garland, ribbon and bows and other decorations, current and former White House aides said many pieces are reused. “There’s a warehouse that has all the White House Christmas decorations from all the years, so what we’d do is we go in there and use those, and those are already bought and paid for,” said Deesha Dyer, who served as the social secretary during the Obamas’ final two Christmases at the White House. The National Park Service said it has helped purchase the 53 trees dotting the inside of the White House — similar to the number it acquired in other years. “This year, the trees were purchased from farms in West Virginia and North Carolina,” Park Service spokesperson Jenny Anzelmo-Sarles said. Congress designated the White House a historic site in 1960, giving partial responsibility for its care and upkeep to the National Park Service. Christmas decorations are seen in the East Wing during a preview of holiday decorations at the White House in Washington, Nov. 27, 2017.
Who pays for catered receptions? While thousands of Americans get a chance to see the White House Christmas decor firsthand, a significantly smaller number get coveted invitations to one of the receptions, where lavish spreads of food are served on festive buffets and the bar is open. A Republican National Committee spokesperson confirmed for ABC News that it is footing the bill for all the wining and dining of guests at official receptions this year but would not provide figures for how much it spent. Financial disclosure forms filed with the Federal Election Commission suggest the final tab can top seven figures for the political party in power for a season of holiday gatherings at 1600 Pennsylvania Ave. The Democratic National Committee spent an average $1 million every year of President Barack Obama’s second term for social events at the White House during November and December — money mostly spent on catering, food and beverages, according to filings reviewed by ABC. The payments are listed on FEC forms as distributions to the Treasury at “Reservation #1,” the National Park Service’s terminology for the White House grounds. The Republican National Committee has not yet reported its disbursements to the Treasury for November and December 2017. The formal seasonal receptions funded by the party include a ball for members of Congress, a White House staff party, a reception for members of the White House press corps and one for military families, according to Grisham. Christmas decor adorns Red Room of the White House in Washington, Nov. 27, 2017. For those campaign supporters and volunteers, support staffers and interest group representatives to whom the White House wants to extend a holiday invite but can’t accommodate for a reception, there are open houses, which have a much lower overhead. Food and drink are not typically provided at open houses, and the president and first lady don’t usually attend, current and former aides said. The official White House Christmas tree adorns the Blue Room of the White House in Washington, Nov. 27, 2017. President George W. Bush and Laura Bush hosted 25 to 30 open houses and 12 to 15 receptions each year, McBride said. Dyer estimated that during her tenure, the Obamas hosted 16 to 20 holiday receptions a year. In Barack Obama’s first year in office, more than 50,000 people received invitations to attend one of 17 holiday receptions or 11 open houses, administration officials said at the time. The 2009 festivities were scaled down from previous seasons, Michelle Obama’s staff said, in an acknowledgement of the recession. Ornaments are hung on a Christmas tree in the Red Room at the White House during a press preview of the 2017 holiday decorations, Nov. 27, 2017, in Washington. While the Trumps are hosting a similar number of receptions, McBride said the Trump goal of 100 Christmas open houses is ambitious. “To suggest that there are a hundred open houses — I don’t know how you physically do that,” McBride said. This year’s theme, “time-honored traditions,” was designed by Melania Trump with a nod to White House holiday traditions dating back over 200 years. It includes a display of President Franklin Roosevelt’s 1866 edition of “A Christmas Carol” and a room set for a formal Christmas dinner using china from President Ronald Reagan’s era. ABC News’ Devin Dwyer and Karen Travers contributed to this report.